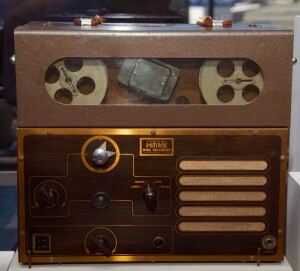 A Peirce 55-B dictation wire recorder from 1945. Courtesy of Stanford University Libraries. Source: Wikipedia. A good portion of our nation’s heritage has been immortalized in sound recordings. From the late 19th century to the present, sound recordings have been used to capture music, speeches and historic events, the oral histories of people who have lived through important events in our nation’s history. As with many electronic and mechanical recordings, however, this vast heritage is in danger. In an effort to save what we can of these timeless recordings, the Library of Congress has put together a blueprint in the form of a National Preservation Plan. This plan is the result of nearly a decade of work that was mandated by Congress as part of the National Recording Preservation Act of 2000. Experts estimate that more than half of the titles recorded on cylinder records—the dominant format used by the U.S. recording industry during its first 23 years—have not survived. The archive of one of radio’s leading networks is lost. A fire at the storage facility of a principal record company ruined an unknown number of master recordings of both owned and leased materials. The whereabouts of a wire recording made by the crew members of the Enola Gay from inside the plane as the atom bomb was dropped on Hiroshima are unknown. Many key recordings made by George Gershwin no longer survive. Recordings by Frank Sinatra, Judy Garland, and other top recording artists have been lost. Personal collections belonging to recording artists were destroyed in Hurricanes Katrina and Sandy. Organize an advisory committee of industry executives and heads of archives to address recorded sound preservation and access issues that require public-private cooperation for resolution.